Need a new roof for your gas station? A repair service for the roof on your school’s gymnasium? Or, maybe you require a brand-new roof for your neighborhood cafe? Whatever your commercial roofing needs, working with Veterans National Property Services is your best bet. We are a Service-Disabled Veteran-Owned Small Business (SDVOSB) as well as a minority-owned business that has been completing commercial roofing projects for many years using only the best materials and roofers. As if all of these incredible features and benefits weren’t enough, Duro-Last’s roofing systems also come with an amazing No Dollar Limit warranty that covers all damage and repairs for up to 20 years. Plus, you can feel confident that your new Duro-Last roof will be installed flawlessly, as our roofers have a special manufacturer certification that requires they undergo extensive training in order to install this material. We also run a tight ship during each installation and require our employees to remain respectful of you and your company’s building throughout your entire project. 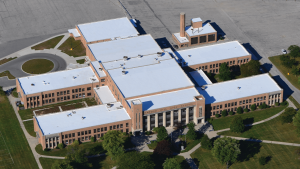 When you partner with VNPS, you can count on an exceptional installation experience and a roof that will last years to come. We have many other commercial roofing systems available in addition to Duro-Last like standing seam metal, modified bitumen, and TPO membranes. Basically, whatever you need for your commercial roofing project, we’re sure to deliver. That’s because we are a company that truly cares about each of our customers, and we always strive to provide a solution that will suit your specific needs. We will start your project off on the right foot, making realistic promises that we can follow through on. Throughout the installation process, we will always remain communicative, so you’re never left in the dark about progress. For more information on our commercial roofing services, contact Veterans National Property Services today. We serve businesses in the Tampa Bay area.